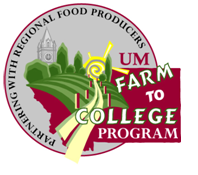 UM Farm to College supports agriculture and economic development statewide by purchasing Montana food products to serve in our dining venues. The UM Farm to College (FTC) Program brings fresh, locally grown and processed food to campus through direct relationships with local farmers, ranchers, and businesses. University Dining Services initiated the FTC Program in the spring of 2003 in partnership with the Environmental Studies Program. It was the first program of its kind in Montana and is now a leader in institutional sustainable food purchasing nationally. From apples to zucchini, local products are used year-round in every UDS managed food venue on campus, including the Food Zoo Dining Room, Cascade Country Store, University Catering, UC Food Court, UM Concessions and our coffee operations Think Tank, Biz Buzz, Recess, and LaPeak. If you have questions about when and where our local products are served, please contact the Director of UDS Sustainability (406) 243-4042. FTC Mission: The FTC Program supports agricultural and economic development statewide by purchasing Montana products to serve in our dining venues. We educate the campus community and others about Montana food and agriculture, thereby strengthening connections between the urban and rural areas of our state. We seek to reduce our environmental impacts by shortening the physical distance that our food travels and by purchasing for ecologically responsible businesses. Raised, grown, or wild harvested in Montana or is unique to the state. Processed or manufactured by a Montana owned business. Processed or manufactured by any business that primarily uses raw materials for Montana. The Farm to College Impact: Institutional local food purchasing programs like ours have the potential to drive economic development. We purchase approximately $4,000,000 in food supplies each year. Out of that amount, we spend 22.5% (or $850,000) on local food products through 120 local farms, ranches, and businesses. Our Farm to College Food Partners are invaluable to our program. FTC takes a collaborative approach to building connections within the Montana local food system to bring Montana foods to our tables. Our organizational partners include the UM Environmental Studies Program, Grow Montana (the state’s food policy council), Alternative Energy Resources Organization (AERO), Community Food and Agriculture Coalition, the Western Sustainability Exchange, Montana Department of Agriculture, Western Montana Growers Cooperative, and the Mission Mountain Food Enterprise Center. Together we are connecting producers and consumers and scaling up the Montana local food economy. Increased marketing opportunities for small-scale food producers. Money is further circulated in the local economy. Education about local farming and food systems. Increased access to healthy food. Improved quality of food served. Improved nutrition and obesity prevention, and obesity related diseases. Improved institute/community and urban/rural relationships. Decreased carbon footprint of institutions by the reduced miles food travels. Supporting businesses that utilize ecologically sound production techniques which limit the impact on the environment. All of these benefits support the Montana community and rural landscape that define our state. From sustainable agriculture to community food security, programs like this are some of the most evident and tangible forms of action in creating a local food economy. Posted in Healthy Eating, Missoula, Programs.